Well, here it is. We have reached our final day of Dinosaur Camp. Today is the day our young paleontologists get to practice their developing skills by going on a dinosaur hunt. This is one of the most anticipated parts of this camp. 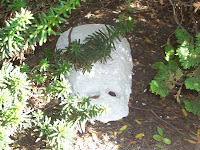 Before the children arrive at camp, "dinosaur bones" are hidden outside. Then after we have our craft for the day. 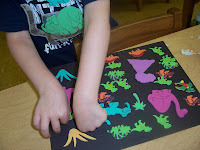 The children get to go outside, "dig" for dinosaur fossils, then we have to put the fossils together to create a whole dinosaur--the kids LOVE this. 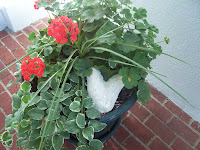 The bones I have are VERY heavy, it takes two of us to carry the container they are kept in. The bones actually came from my very patient and gung-ho sister-in-law(the same one who made the race car cake). 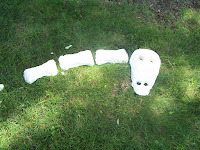 To make these bones she used plaster of paris and sand molds. She molded the bone shapes in the sand and then poured in the plaster of paris--that's a lot of plaster of paris--and a lot of patience. She found the project somewhere, but I don't have specifics. When I get ahold of her I will let you know. 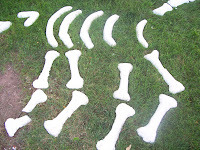 She had made these bones for her son's birthday party and passed them on to me to use at camp. When the bones are all put together, they make a cute dinosaur. As you can see, I've had these a few years, and yes, they can break. Our day consisted of first discussing what the earth looked like when the dinosaurs lived. We talked about lots of trees. water, rocks, swamps, and volcanoes. 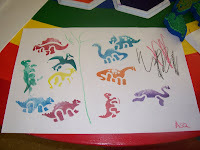 The children drew a picture with crayons, then we used dinosaur stamps and ink to add dinosaurs to the picture. 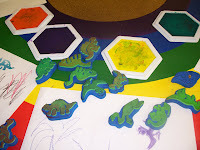 I had different colors, but by the end of the project they were well mixed. I have had the dinosaur stamps for quite a few years, but yes, I did get them at Oriental Trading(I couldn't find jus the stamps, only a kit, sorry). 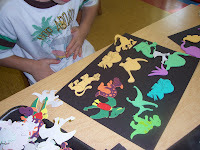 Another project they could participate in was using brightly colored foam dinosaur stickers on black paper to make a delightful picture. This was on the table for anyone interested. Oriental Trading had some great foam stickers that I used this year, but in previous years I did get them from our local craft store. 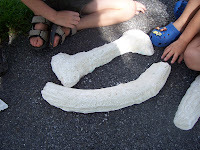 After clean up we got together, went outside and had our best part of the day--finding dinosaur bones! The children were all over finding them all. Then we sat down and put the pieces together to create our masterpiece. For some reason when we were done they kept saying,"Now we're rich." Not really sure why, but I guess they thought someone was going to give us money for our accomplishment. So, that was our week at dinosaur camp. 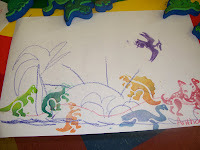 This is always great fun for the kids as they enjoy dinosaurs at this age immensely. Plus, there are so many resources out there for someone putting together this theme. I hope you enjoyed reading about all the great things we've done. UPDATE: I got some information back from my sister-in law. She is 98% sure that she got the idea from a Family Fun magazine, about 5-6 years ago. 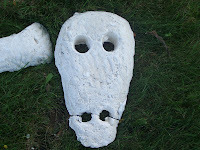 All it is is plaster of Paris; get wet sand, "carve" out the shape of the bone, and pour the thick plaster in. The bone is ready to be removed after 20-30 minutes of sitting out in the sun (depending on how "wet" the plaster is when poured). Good luck. Wonderful idea! I'm so glad I found your blog!